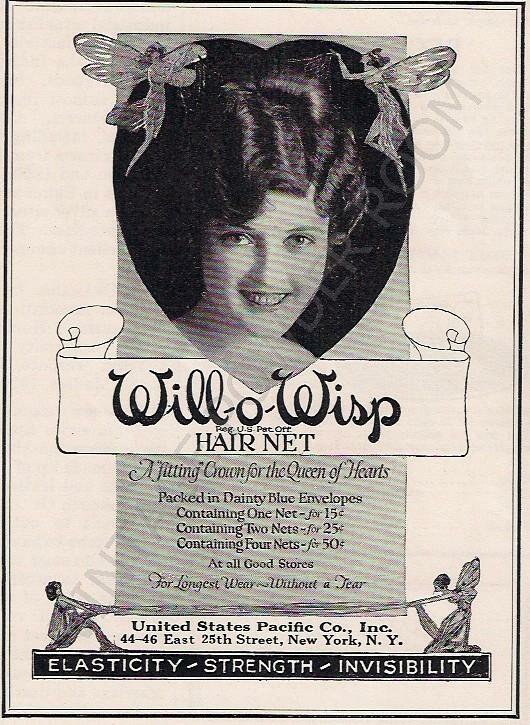 Will-O-Wisp is a rather curious name for a hair net. In Medieval Latin will-o’-the-wisp means foolish fire. The will-o’-the-wisp has been described as a ghostly light sometimes seen at twilight over bogs, swamps and marshes. The light resembles a flickering lamp and will often recede if approached, as if it was being carried off by a fairy. The Will-O-Wisp advertisement above appeared in ASIA magazine in 1922, so perhaps the name and the fairies had something to do with an incident a couple of years earlier in Cottingley, near Bradford, England. 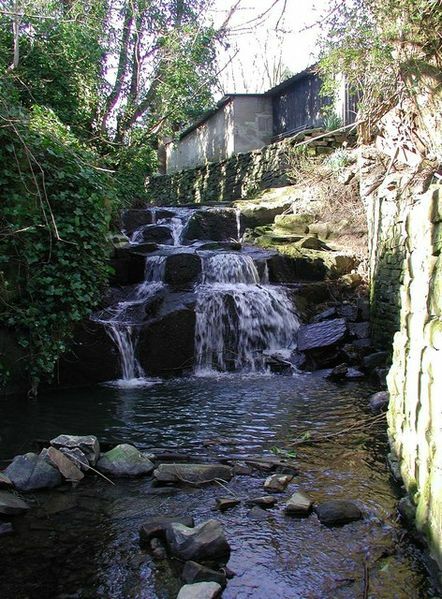 Two young cousins Elsie Wright (16) and Frances Griffiths (10) alleged that they had photographed fairies near Cottingley Beck (stream). 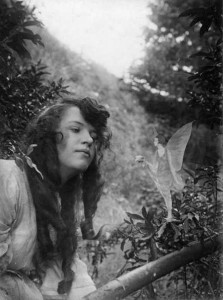 Sir Arthur Conan Doyle, spiritualist and author of the Sherlock Holmes tales, learned of the existence of the the fairy photographs after he was contacted by the editor of the Spiritualist publication LIGHT. Doyle was convinced that they were incontrovertible evidence of psychic phenomena. Not everyone agreed; some felt as Conan Doyle did, and others were certain the photos had been faked. Following WWI many people turned to spiritualism to ease the pain of losing loved ones either in combat or to the Spanish flu pandemic in 1918. 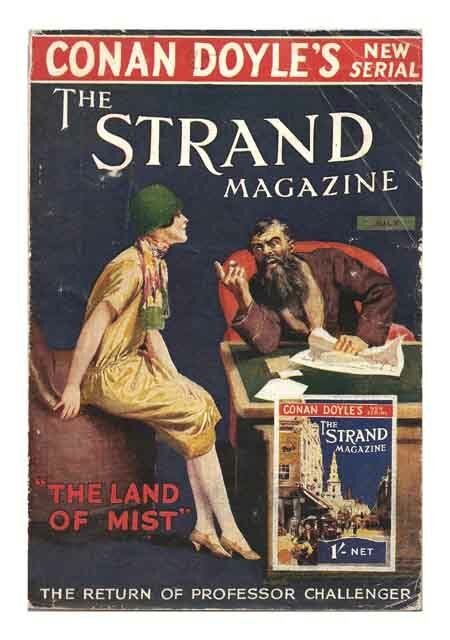 Conan Doyle had his own reasons for his belief in spiritualism. Doyle’s wife Louisa had been deceased for over ten years when their son Kingsley died on October 28, 1918 right before the end of WWI. Kingsley had contracted pneumonia while convalescing after having been seriously wounded in 1916 during the Battle of the Somme. Kingsley’s death plunged Doyle into a deep depression. The grieving man had little time to mourn his son before he lost his brother Innes, his two brothers-in-law, and two nephews. Suffering so many devastating losses in rapid succession set Doyle on a quest to find a way to cope with his anguish. 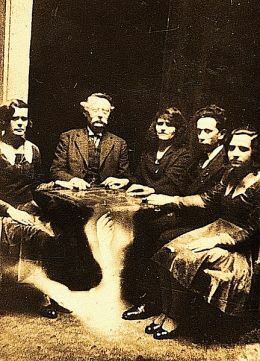 Séances and Ouija boards became popular ways in which to attempt to make contact with the spirit world. There were people who were sincere in their beliefs in paranormal phenomena, and of course there were countless charlatans out to make a quick buck by exploiting the grief of those whom the dead had left behind. The Cottingley photographs became public in mid-1919 after Elsie Wright’s mother Polly attended a meeting of the Theosophical Society in Bradford. The lecture topic that evening was “Fairy Life” and at the end of the meeting Polly Wright showed two photographs taken by her daughter and niece to the speaker. The photos caused a stir. They were displayed a few months later at the Society’s annual conference in Harrogate where they came to the attention of Edward Gardner, a Theosophical Society big-wig. Initially Gardner had the photos examined by Harold Snelling, an expert in photography. Snelling concluded that the negatives were genuine, which wasn’t exactly the same thing as verifying their content; however, an enthusiastic Edward Gardner used prints of the fairy photos in illustrated lectures he gave around the U.K.
Sir Arthur Conan Doyle had become aware of the Cottingley photos at about the same time that he’d been commissioned by THE STRAND MAGAZINE to write an article on fairies for their Christmas issue. Just as Gardner had done, Doyle took the photos to various experts in an effort to determine their authenticity. Kodak declined to issue a certificate of authenticity, as did another photographic company, Ilford. Gardner and Doyle wanted desperately to believe the the photos were genuine. They concluded that the fairies in the photos must have been real because only one out of the three experts’ they’d queried had reported unequivocally that there was “some evidence of faking”. Gardner and Doyle heard what they wanted to hear. 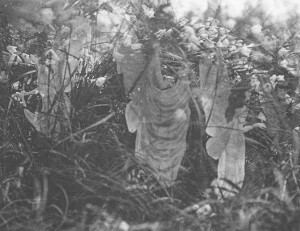 In July 1920 the two cousins Elsie and Frances spent a school holiday together in Cottingley so that they could take more photos of the fairies. Bad weather kept the girls, and presumably the fairies, indoors until mid-August. The girls insisted that the fairies wouldn’t show themselves if others were watching, and so Elsie’s mother was persuaded to visit her sister’s home for tea leaving the two girls alone. While Elsie’s mom was enjoying her tea the two girls were busying taking photos.. 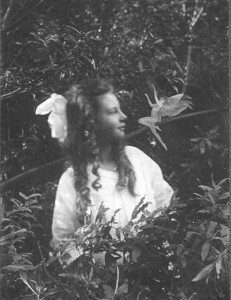 The first photo was entitled “Frances and the Leaping Fairy” and shows Frances in profile with a winged fairy close to her nose. The second photo “Fairy Offering Posy of Harebells to Elsie” shows a fairy offering Elsie a flower. The third photo “Fairies and Their Sun-Bath” was taken two days later and shows only fairies. Conan Doyle used the 1920 photos for a second article in THE STRAND MAGAZINE, and subsequently used the photos and the STRAND article to form the basis of his 1922 book THE COMING OF THE FAIRIES. Many of the adults around Elsie and Frances continued to believe in fairies – they wrote books and held séances; but what about Elsie and Frances the fairy photographers? Had they faked the photos? Of course they had. 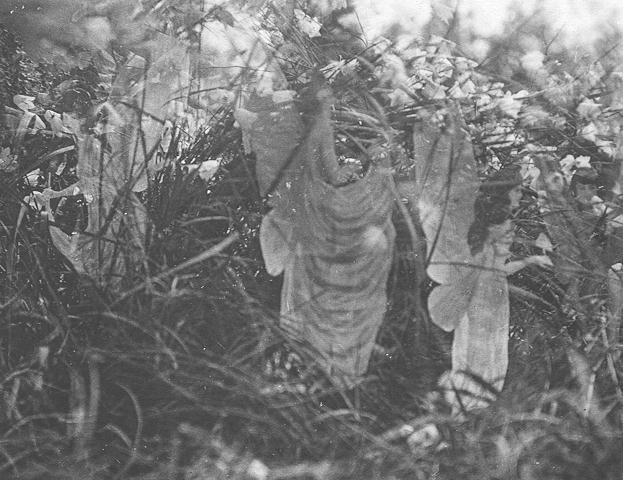 The Cottingley fairies bear an uncanny resemblance to illustrations from PRINCESS MARY’S GIFT BOOK, don’t you think? Conan Doyle showed the Cottingley photos to physicist and psychical researcher Sir Oliver Lodge, who believed the photos to be fake. Sir Oliver thought that a troupe of (tiny?) dancers had masqueraded as fairies, and in particular he expressed doubt as to their “distinctly Parisienne” hairstyles. Despite Lodge’s opinion, Sir Arthur Conan Doyle remained a true believer in spiritualism and in the existence of fairies to the end of his life. I don’t believe in fairies, but I do believe in the indefatigability of the human spirit in the face of unimaginable horror and tragedy. If the human spirit occasionally needs to manifest itself in sweet-faced little beings with wings, that’s fine with me. Another of the skeptics of the Cottingley photographs noted that the fairies “looked suspiciously like the traditional fairies of nursery tales” and that they had “very fashionable hairstyles” – which brings us full circle to the adorable, and stylishly coiffed, fairies on the Will-O-Wisp hair net advertisement.